by Samuelson, William, Marks, Stephen G., Samuelson, William F.
Samuelson, William, Marks, Stephen G., Samuelson, William F.
The right economic tools to make the right business decisions! In today2s highly competitive business environments, managers must be able to make increasingly complex decisions-decisions that sometimes determine whether a firm prospers or even survives. Now more than ever, top-notch managers are relying on economic analysis to make the right business decisions. That2s why William F. Samuelson and Stephen G. Mark2s Fourth Edition of MANAGERIAL ECONOMICS illustrates the central problems you2re likely to face as a manager, provides the economic analysis techniques you need to guide your decisions, and shows how these techniques are used by practicing managers. Updated with modern management techniques, Fourth Edition features many revised applications, and new and expanded coverage of game theory, decision making under uncertainity, international topics, e-commerce, and the Internet. Features Managerial decision making is emphasized and woven throughout every chapter in the book. Real-world applications throughout the text challenge you to ponder possible choices. End-of-chapter spreadsheet problems offer a powerful way of portraying economic decisions and finding optimal solutions without a large investment in calculus methods. Shows how to use game theory to analyze the firm2s strategic choices. Explains how to use decision trees to structure decisions in highrisk environments. Includes expanded coverage of international topics and applications. 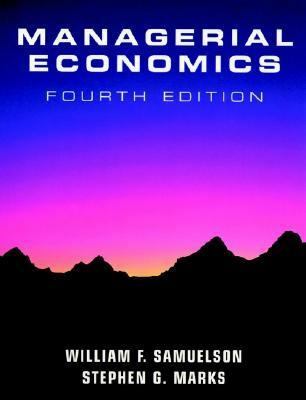 E-commerce applications appear throughout the text.Samuelson, William is the author of 'Managerial Economics', published 2002 under ISBN 9780470000441 and ISBN 0470000449.